Hi everybody! 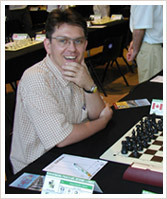 I am national master Saša Kulić, which in English translates to Sasha Kulich. If you would like to learn how to play chess, need some advice on how to improve your game, or want to bring your chess skills to the next level, I would like you to consider me as your chess teacher or coach. I live in Toronto, Canada and that's where most of my students are from. However, with help of new internet technologies, it is also possible to arrange lessons over the internet. Just ask. I believe, my lessons will not only help your chess understanding, but will make you appreciate the beauty of the game. Chess is my passion, and now it can become yours, too.